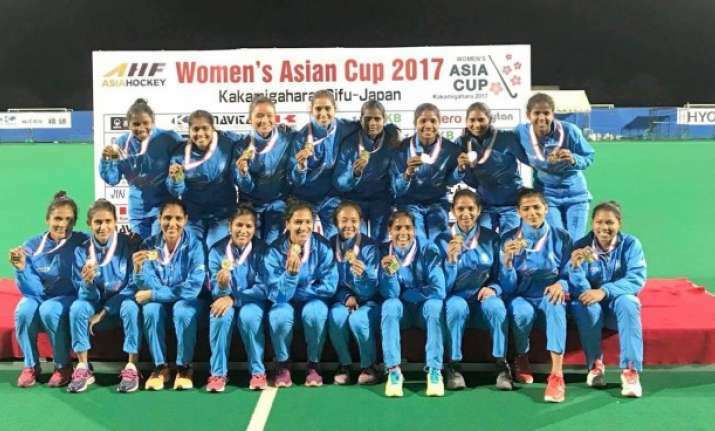 The women's team recently created history by winning the Asia Cup 2017 after beating China in the final. Image Source : HOCKEY INDIA A file image of the Indian women hockey team. Hockey India today named 33 players for the Indian women's national camp to begin in Sports Authority of India, Bengaluru from November 26. The players will report to Indian women's hockey team's chief coach Harendra Singh and will train together till December 23. Their exuberant performance not only won them the qualification for women's World Cup to be played in London next year but it also helped them climb up the FIH World Ranking to a commendable 10th position. "2018 is a very crucial year for Indian hockey. Through our performance in Asia Cup we climbed the world ranking but Commonwealth Games, Asian Games and World Cup are big tournaments and our training is focused on doing well in these events," chief coach Harendra said. The team's aim will be to finish on the podium in at least the Commonwealth Games or the Asian Games. "Our aim is to finish in the final of the Commonwealth Games and also qualify for the 2020 Olympics by winning the Asian Games. The coaching staff has identified the team's shortcomings during Asia Cup and we will work on improving in those areas. "Another important aspect will be improving our speed and strength during this month-long camp. We will also be testing a few junior players and see how they keep up with the demands of senior women's hockey," Harendra said. Forwards: Rani Rampal, Vandana Katariya, Preeti Dubey, Reena Khokhar, Anupa Barla, Sonika, Lalremsiami, Poonam Rani, Navneet Kaur, Navpreet Kaur.